Mundekulla is situated in beautiful Småland (Sweden) where lush fields, lakes and forests contribute to peaceful surroundings. In this landscape you will find the perfect circumstances to go deeper into your yoga practice. From early morning until late evening you can put all your focus on yoga, meditation and nature. I will be there teaching Yin yoga, two of my favorite-favorite teachers Sky (from Canada) and Satya (from Denmark/India) will be teaching yoga, mantra, yogic philosophy and much more I'm sure! Yoga celebration is exactly what the name refers to - celebration of life = yoga!! More information on this year's retreat on Facebook / on Gaiatree and on Mundekulla websites. Mundekulla on üks imeline paik Småland-il (Rootsis), kus korraldatakse erinevaid laagreid, muusikaüritusi, workshope. Keskus ise ning seda ümbritsev loodus on seal justkui selleks, et lubada sul oma praktikatega sügavuti minna. Nii on sul võimalik hommikust kuni hilisõhtuni nautida joogat, meditatsiooni ja loodust. Mina annan festivalil Yin jooga tunde, aga Mundekullas on kohal ka minu lemmikõpetajad Sky (Kanadast) ja Satya (Taani/India), kes õpetavad joogat ning laulavad mantraid ning räägivad jooga (ja elu) filosoofiast. Info selle aasta festivali kohta on saadaval: Facebook / või Gaiatree ja Mundekulla veebilehtedel. Järgmise aasta festivali info saadame laiali 2016 aasta alguses. This is such an amazing space - a center for buddhist meditation and studies. Spacious and peaceful! This class that has been running regularly every single Monday in Berlin for 6 years! 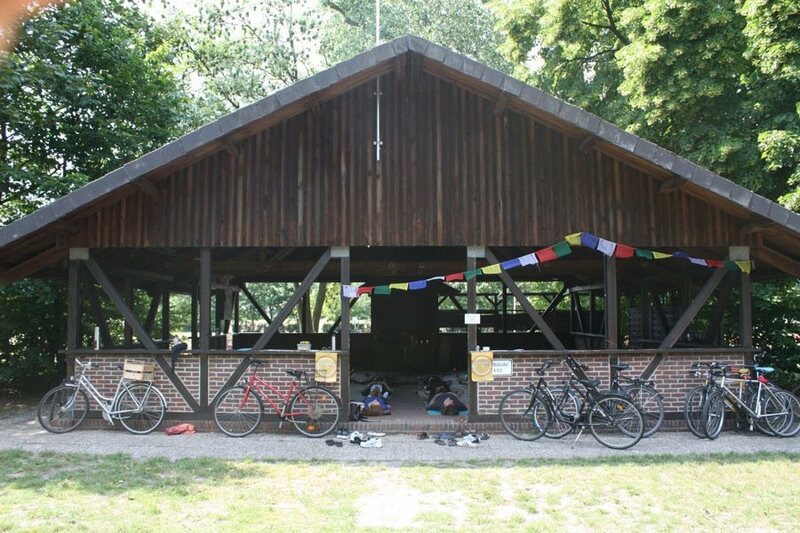 You are very welcomed to join this colourful, friendly, long-established international community in Berlin. SLOW FLOW / GENTLE YOGA - is great for beginners and everyone wanting a gentle, accessible Yoga experience. 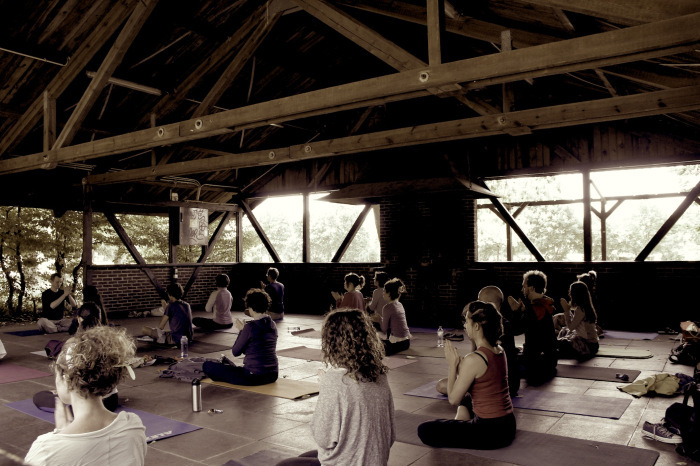 The teaching is based on Vinyasa style, movements connected with the meditative flow of breath. You will leave this class feeling clear, calm and refreshed. VINYASA FLOW / DYNAMIC YOGA - is an intermediate-level class for yogis who have practiced for a little while and are ready to dive deeper. You will enjoy a wide variety of positions and breathwork, new techniques, rich philosophy insights, and energized sequences of movement connected with the flowing rhythm of your breath - culminating in a long, deep relaxation and calming meditation. Follow the orange Yoga in English signs to a courtyard. Please note - there is a German Yoga place at number 10, so do make sure you come around the back to 11C. 5 elementi on šabloon, mille järgi liigume, kogeme, avastame, transformeerume (?) kasutades Yin joogat, Vinyasa joogat, QiGong-i elemente, kontakti kaasinimestega. Meie liikumist inspireerib oma muusikaga Eli Salzman. Kõik meie sees ja ümber koosneb 5 elemendist (Pancha Mahabhuta): Maa, Vesi, Tuli, Õhk, Eeter/Ruum. Igal elemendil on teatud omadused, mida on võimalik oma kehas kogeda, tunnetada, uurida, avastada. Hiiumaa is this amazing small island off the west coast of Estonia. It has become a small tradition to hold a spring retreat in the beginning of spring, when the trees are budding and the nature is awakening! You will be in amazing natural setting right by the sea, with basic accommodation, home-cooked meals, yoga and meditation practice in the mornings and evenings. The early bird price until 1st of April 170€ (includes 3 nights of accommodation, 3 meals per day, at least 2 yoga classes per day). Kevadlaager Hiiumaal on saanud juba pisikeseks traditsiooniks. See on kutse võtta mõneks päevaks aeg maha, olla ilu, rahu ja vaikusega koos! Hõbekala külalistemaja asub otse mererannal. Meie elamine on lihtne ja hubane, toit tervislik ja kodune, jooga ja meditatsioonitunnid igal hommikul ja õhtul. Üks pikk nädalavahetus, neljapäevast kuni pühapäevani, fookuseks ärkamine - keha ja meele kevadpuhastus läbi jooga ja meditatsiooni. Kiirele reageerijale hind 170€. Kogu info Hiiumma kevadlaagri kohta on SIIN. Walk to the 3rd courtyard, turn right, walk to the door, press Play2C/Osho buzzer, 1 flight of stair up. GENTLE VINYASA YOGA - it is a more flowing version of Hatha yoga. The tone and pace of the class will be gentle and mellow, so it is very suitable for beginners or people who enjoy a more relaxing and calming type of yoga. There will be plenty of alignment instructions and variations on poses if you choose to take your practice deeper. A Vinyasa style yoga connects movement with breath, the sequences of postures are built in a way that leaves you feeling clear, free, relaxed and refreshed after your practice. I will be combining breath-work and mindfulness concepts into the class theme. The class draws in a regular medium-sized crowd of Berliners, resident internationals and visitors, so it is a great way to get to know and meet like-minded people. 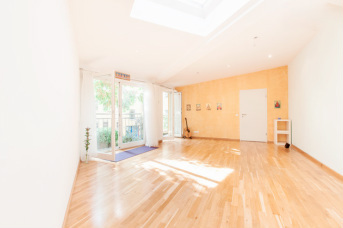 Many people are drawn by the location in the heart of Kreuzberg and the venue - the studio is open and spacious. LIINA & ELI pakuvad joogat, elavat muusikat ja tantsu. CONTACT us if you want us to offer this combo at your event or studio. My challenge and invitation to my yoga people in Tallinn, is to begin the new year not only with good intentions, but with wholesome and gratifying deeds. The invitation is to take time out your daily schedule, to practice every day for 6 days in a row. I ideally look for your commitment for the entire 6-days, as that way your practice can start building new pathways for healthier choices and ways of living. If you want more information in English, then please contact me HERE. See on minu väljakutse, üleskutse ja ettepanek sinule. Alustada uut aastat mitte pelgalt heade kavatsuste, lubaduste ja soovidega, vaid tõhusate ja mõnusate tegudega. Mul oleks hea meel, kui sa kõigiks 6-ks päevaks oma pühendumise annaksid, sest nii läbi tehtu/kogetu kinnistub ja saab sind eesootaval aastal tõhusamalt kanda. Linnalaagri kirjeldus ja sinu nädalane joogaprogramm on SIIN. Tea and snacks after the class, feel free to bring some and share! The weekend Park Yoga is a shared teaching event!! Anya Kinneavy and Ronny Korneli will teach alternate Saturdays, Marta Jurowska and me (Liina) will teach alternate Sundays. The classes are suitable to all levels, they will be Vinyasa style flow classes with alternatives and options for you to accommodate your practice to the level of your experience. The park yoga sessions are also a very fun and relaxed way to meet your yoga community and set a tone for your summer weekends in the city. Sundays in July and August are taught by Marta Jurowska. 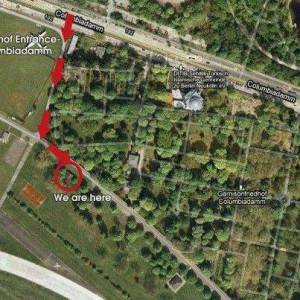 LOCATION: a Pavilion at Tempelhof Park, near beergarten, enter from Columbiadamm entrance (see the map above). The Indigo space is a lovely room that fits about 10 people, so the classes will be more private, there's more one-on-one attention, more special themed classes tailored to your needs and expectations. There's always tea (and sometimes also a light meal!!) after the class, so it's a real homey, family, community atmosphere that I with the help of the Indigo people are trying to create. VINYASA FLOW YOGA classes are suitable to all levels, it might take you a few classes to get into a comfortable rhythm and find your flow if you are a complete beginner. I tend to be precise and detailed in my instructions, I do like to kindly offer challenges for those who are up to it, I'm but never too serious about my practice or yoga or life in general. You can expect a moderately paced flow practice that focuses on alignment and breath, combining movement and stillness, aiming at creating strength without tension and motion without rushing. YIN - YANG YOGA classes will be a fusion of longer held stretches and gentle movements and flow. This practice is designed to help and guide you to slow down, to drop in, to let go of what no longer serves you, to explore and feel into the holding patterns in your body, mind and breath, to restore and to renew. Sounds amazing? It is!! In time this practice cultivates patience, surrender, contentment and gratitude. In a Yin style practice the poses (asanas) are held for longer periods of time while relaxing the outer muscles of the body in order to reach the deeper tissues. In these passive holds the three ancient practices - Yoga, Traditional Chinese Medicine and Buddhist mindfulness techniques - are joined to give a holistic, wholesome and long-lasting framework for health, greater awareness and wellness. YIN-YANG YOGA - the Wednesday's is fusion class aiming to create harmony and balance in the body and mind by combining deep stretches for release (Yin) with creative flows through poses to energize and strengthen (Yang). Dynamic, active, constantly changing, the flowing and moving part of life - that's Yang energy. The passive, silent, deep, allowing, deeper, mystical and observing part of life - that's Yin energy. The harmony lies in the balance of these two energies. The Yin and Yang practice bring together the two sides of the whole - the quality of chi (lifeforce, energy) is enhanced by using the Yin practice to create space, accpetance and wakefulness with an unhurried and unambitious attitude; then bringing the mindful attitude into a more active, flowing Yang practice improves the mobility of chi. Yin Yoga is a very effective way to prepare both the body (by opening the hips and spine) and the mind (concentration, focus) for meditation, therefore the class often includes some breathing exercises (pranayama) and meditation. YIN YANG YOGA - this is fusion class aiming to create harmony and balance in the body and mind by combining deep stretches for release (Yin) with creative flows through poses to energize and strengthen (Yang). Dynamic, active, constantly changing, the flowing and moving part of life - that's Yang energy. The passive, silent, deep, allowing, deeper, mystical and observing part of life - that's Yin energy. The harmony lies in the balance of these two energies. The Yin and Yang practice bring together the two sides of the whole - the quality of chi (lifeforce, energy) is enhanced by using the Yin practice to create space, acceptance and wakefulness with an unhurried and unambitious attitude; then bringing the mindful attitude into a more active, flowing Yang practice improves the mobility of chi. Yin Yoga is a very effective way to prepare both the body (by opening the hips and spine) and the mind (concentration, focus) for meditation, therefore the class often includes some breathing exercises (pranayama) and meditation. MEDITATION - this is a weekly drop-in meditation class suitable for all levels. We will be exploring various meditation techniques, using Yoga philosophy and Buddhist mindfulness techniques. Meditation is where the magic really unfolds in Yoga. Being able to relax into the present moment - however it presents itself to us – will benefit every area of your life. There will be space to discuss personal experiences and ask any questions to help you go deeper. We'll conclude with a lying relaxation, just like in a Yoga class, so you'll leave feeling calm, collected and centered. Yin yoga opens the hips, relaxes the muscle tension in the body and calms the mind hence being a prefect preparation for meditation. Feel free to join the Yin yoga class conveniently offered right before the meditation session. YIN-YANG YOGA - the Wednesday's YinYang yoga is fusion class aiming to create harmony and balance in the body and mind by combining deep stretches for release (Yin) with creative flows through poses to energize and strengthen (Yang). Dynamic, active, constantly changing, the flowing and moving part of life - that's Yang energy. The passive, silent, deep, allowing, deeper, mystical and observing part of life - that's Yin energy. The harmony lies in the balance of these two energies. The Yin and Yang practice bring together the two sides of the whole - the quality of chi (lifeforce, energy) is enhanced by using the Yin practice to create space, accpetance and wakefulness with an unhurried and unambitious attitude; then bringing the mindful attitude into a more active, flowing Yang practice improves the mobility of chi. Yin Yoga is a very effective way to prepare both the body (by opening the hips and spine) and the mind (concentration, focus) for meditation, therefore the class often includes some breathing exercises (pranayama) and meditation. THAI HAND CLASSES ARE TAKING A BREAK FOR THE SUMMER! Check back in for the autumn schedule in September! This is a unique format, developed by ITM Thai Hand International. NO EXPERIENCE of any kind is necessary! I will lead and guide you through a simple flow of Thai Yoga Massage stretches that stimulate the main acupuncture points and meridian/energy lines. The massage is done in pairs, you will receive a 45 minute massage and you will give a 45 minute massage. You can come alone and we will pair you up with someone or you can come with a friend and practice together. Wear comfortable clothes that allow you to move and be stretched freely and comfortably. The Thai Yoga Massage gives best results when done regularly, therefore we have a special offer for 10-lesson card for 125€. THAI HAND YOGA CLASSES ARE TAKING A BREAK FOR THE SUMMER! Check back in for the autumn classes in September! I'm excited to offer the Yin classes in this venue as Yin Yoga and Thai Yoga Massage originate from the same roots, combining Chinese Medicine and Yoga and aiming for a similar results - stretching the deeper muscles and stimulating the energy lines (meridians) in the body to generate overall well-being of the physical, energetic, emotional and mental body. Dynamic, active, constantly changing, the flowing and moving part of life - that's Yang energy. The passive, silent, deep, allowing, deeper, mystical and observing part of life - that's Yin energy. The harmony lies in the balance of these two energies. The Yin and Yang practice bring together the two sides of the whole - the quality of chi (lifeforce, energy) is enhanced by using the Yin practice to create space, accpetance and wakefulness with an unhurried and unambitious attitude; then bringing the mindful attitude into a more active, flowing Yang practice improves the mobility of chi. Yin Yoga is a very effective way to prepare both the body (by opening the hips and spine) and the mind (concentration, focus) for meditation. It is a super beneficial practice first thing in the morning. My Yin-Yang classes are a fusion of passive Yin holds, followed by a slow mindful flow through sun salues and creative sequences of poses that complement the Yin part of the practice. The class often including some breathing exercises (pranayama) and meditation. Yin yoga is a perfect preparation of both body and mind for meditation, so feel free to stay and join the meditation class right after!